Delicious Velvety Guacamole Dip Recipe You Are Sure To Enjoy! 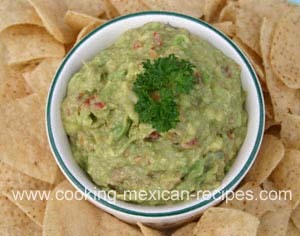 Try my guacamole dip recipe. It’s probably a little different from what you’ve had in the past. It doesn’t have lime juice or cilantro. My dad wouldn’t allow it when we had our restaurant. And I think he was right. This is way better, but enough of the bragging. Don’t you just love good guacamole? Well I’m going to show you how to make the most delicious tasting guacamole you have ever had. It all starts with the right ingredients and that means specifically avocados. Depending on the time of year, you will find different kinds of avocados. Hass avocados are really the best as they tend to be more flavorful and oily instead of watery. This guacamole dip recipe will taste the best if you use Hass avocados! When picking out tomatoes, try and find the more flavorful ones. Those that are home grown are absolutely the best and would be your number one choice. Of course growing your own isn’t always possible. At the grocery store look for vine-ripened tomatoes. They usually taste quite good. Combine the tomatoes, chile, and onion on a cutting board and chop until the ingredients are fine. Scoop out the avocados and place in a bowl and add the tomato mixture. Mash with a potato masher. Add salt and hot sauce to taste. Some people add lemon or lime juice to their guacamole. In some cases people do it to keep the guacamole from turning brown. We felt it changed the flavor too much. We chose not to disguise that wonderful avocado flavor and instead made our guacamole more frequently. You can also try leaving the avocado pits in the guacamole to help keep the dip from turning brown. Just remember to remove them before serving. I didn’t find that this helped much. Try making guacamole with and without lemon and see what you like better. Don’t be afraid to experiment a little with this guacamole dip recipe. But after you try it both ways, I will wager that you will choose to make it without the lemon or lime juice. Here is a little tip. After you make guacamole, cover it with plastic wrap and press it onto the guacamole to keep the air out. If your guacamole does turn a little brown after sitting out a while you can just skim off the top layer and it will be just as good as new. It’s the exposure to air that turns it brown, the same way a sliced apple turns brown when left out. This dip is an absolute must for chicken fajitas as well as the top of your enchiladas, inside your tacos or enjoy it all by itself with chips! Click here to watch my How To Make Guacamole video on YouTube.